In 1845 George Spratt published the fourth edition of his highly successful Obstetric tables : comprising graphic illustrations, with descriptions and practical remarks; exhibiting on dissected plates, many important subjects in midwifery. This illustrated anatomical ‘flap book’ is a recent addition to the Sir George Grey Special Collections printed collection. You can view a digitised version of the 1835 edition through the Internet Archive, or come visit us on Level 2 of the Central City Library to turn the pages (and lift the flaps) yourself. Obstetric tables was published as a training aid at a time when it was becoming difficult for medical students to gain clinical experience. It contains a large number of layered illustrations that can be lifted to provide ‘dissected’ views of the female body in pregnancy. Some of the plates contain as many as four or five layers, showing for example the different stages of pregnancy, the position of a baby during birth, and use of forceps in an assisted delivery. Ref: George Spratt. Obstetric tables. London,1845. Sir George Grey Special Collections, Auckland Libraries, 618.2 S76. 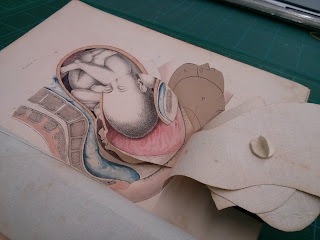 These types of ‘pop-up’ anatomical books are commonplace now (and are still produced as children’s books), but the technical skill involved in designing and producing Obstetric tables made it innovative in its time. The use of movable parts in medical texts has a surprisingly long tradition, with earliest examples dating back to the 16th century; however it wasn’t until the 19th century that more complex techniques were used. You can see many stunning examples online in Duke University’s Animated Anatomies online exhibition. In the 19th century books such as Obstetric tables appealed to a wider audience than just medical practitioners, and were also appreciated as works of graphic art and objects of curiosity. George Spratt himself is likely to have been aware of this general interest potential. Spratt was a member of the Royal College of Surgeons and is described on the title page as a ‘surgeon-accoucheur’, or male midwife. However he was also an artist and entrepreneur who had previously collaborated with lithographer George Madeley on several ventures. As well as the highly successful Obstetric tables, Spratt and Madeley produced the botanical book Flora Medica (1829-1830), and a series of composite caricatures sold individually as prints between 1830 and 1831. 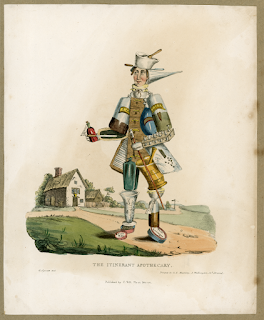 Ref: George Spratt, The Itinerant Apothecary, London, England, 1830, Science Museum,1989-451/2. Obstetric tables is a wonderful new addition to the Library – in its subject matter, illustrative technique, and as a complement to other pop-up and movable books we have in our Special Collections.